While procrastinating, a favorite pastime of mine, I came across a list of what people were planning to give up for Lent. My favorite answer on the list; winter. Yes, I think giving up winter for Lent sounds like a great idea and as I sit here on my couch watching more snow fall and accumulate, I really cannot wait for winter to end! Even so, there is one good thing to come from winter other than Christmas presents, it is actually peak season for citrus fruits. Growing up, my mother would always treat us to grapefruits, usually white ones, and I can remember cutting them in half, pouring sugar over the top and eating the sections. When I went out on my own, I found I preferred ruby red grapefruits to the white ones from my childhood but these days, I skip the sugar and just peel them and eat the segments. Occasionally, I will pick up some juice but, I buy small quantities so that it does not go to waste. However, taking those lovely fruits and making a cooked curd filled tart topped with yet more fresh grapefruit segments never really occurred to me. After reading the recipe, I was rather skeptical that this would work for me. Even though I read the recipe before starting on this tart, I was surprised by just how much time it took to come together. The recipe calls for using a food processor to make the dough for the tart shell, my favorite method for tart and pie dough. My other favorite tart/pie method; using coffee filters and marbles when prebaking the shell. Believe it or not, coffee filters are really the best choice for the task. Parchment paper becomes brittle when baked, creases in a piece of foil can cut the shell and break it and wax paper is covered in wax-who wants that in a tart shell? Coffee filters are very strong; they hold the weight of wet coffee as water pours through it. If you can get restaurant sized filters, you will only need one otherwise you will need to use about 4 of the 8-12 cup filters. The butter in the tart shell will keep the filter from sticking to the dough but if the shell is frozen and allowed to thaw before baking, give the inside of the shell a spritz of spray. Keep in mind that the flour you rolled the dough out with and any condensation that forms on the surface make a thin layer of paste that can glue the filter in place making it difficult to remove and you could either leave some of the filter behind or it could take sections of the crust with it. So if you are worried, err on the side of caution and give it a spritz. 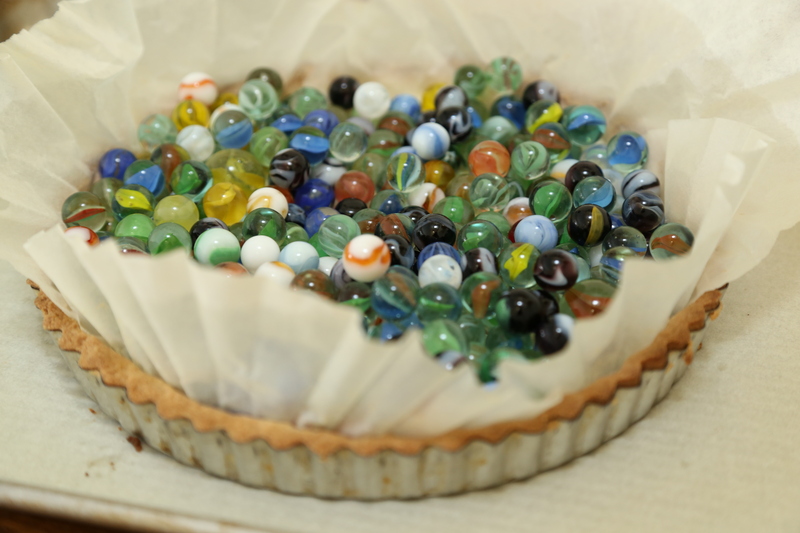 Then there is the question of marbles as pie weights. Well let’s just call them a solution to a dilemma I had; I couldn’t justify using a bag of beans or rice once and then tossing them when I remembered I had a collection of glass marbles. 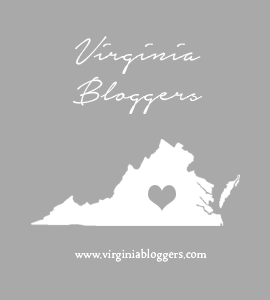 The marbles stepped up to the plate and I have been using them ever since. They conduct heat pretty well, they do not shatter in the oven-at least mine haven’t in all the years I have used them as weights and they are easy to clean. The only down side; marbles bounce. Trust me, if you drop them, they will bounce a few times before disappearing and finally rolling down the basement stairs for the cat to play with…Yes, I have lost a few of my marbles over the years but, I still have enough to do the job. The whole point of this post is the tart, so how did it taste? Let’s just say that it is not my most favorite tart ever. The use of two fillings may seem excessive but it is actually close to genius if you ask this pastry chef. 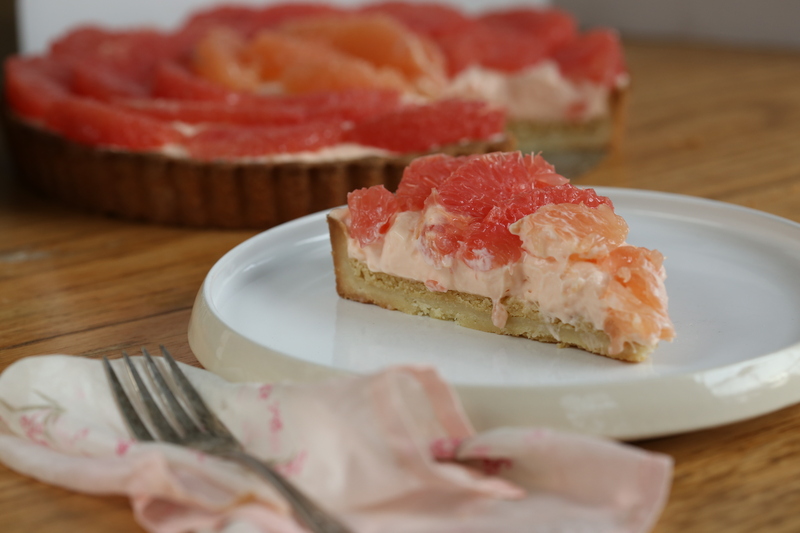 The lemon-almond filling serves to buffer the crust from the moisture of the grapefruit cremeux. There is nothing worse than realizing that your crust is soggy and gummy from the filling! The lemon-almond filling is almost like a frangipan and I toasted the almond flour to give it a little more flavor. The grapefruit cremeux was extremely flavorful but I wonder if it could be made more like a curd and stiffer without the use of gelatin, something I do not enjoy working with-especially now that I do not have a microwave in my kitchen. At first, I wondered about the addition of Campari; I was not sure of the actual flavor of it and decided to taste it and I suggest you learn from my experience and do not drink it straight. However, I am now completely aware of why it is called “bitters” and I was shocked at how well it blended with the grapefruit flavor of the cremeux without making it bitter. The final step is to slice up the fruit so that you have segments to work with. Because the grapefruits are so juicy, they need to be laid out on paper towels and allowed to dry for a few hours. The dry segments are arranged over the two fillings in the baked shell. My fruits varied in color and I was hoping to make an ombre pattern over the top but had to settle for just two shades of pink. All the components come together to give you a strong grapefruit flavor with creamy and sandy textures wrapped around the fresh fruit. It was nice, but not my favorite. Having seen a few photos of some of the other bakers tarts as they prepared them this past weekend, I thought the use of blood oranges or tangerines just for the top might have been better. However, If I make this one again, I am thinking I might like to use fresh raspberries on top of the grapefruit cremeux. 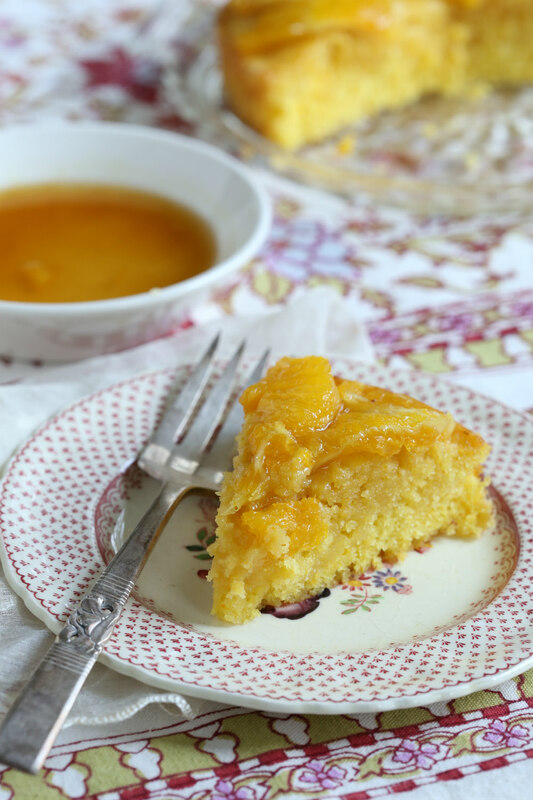 To see how the other bakers fared with this recipe, be sure to visit the Tuesdays with Dorie website. Want to bake with us? Pick up the book and get to work! We post the upcoming recipes on the website and you can bake some of the recipes or all of them-you decide. Our only request, buy the book because we do not post the recipes. Cool! Marbles and coffee filters! I actually invested in pie weights a few years ago, but I do like the coffee filter idea. I ran out of foil, so I scrunched up parchment in a ball and then un-balled (not a word, I’m sure?) it to make it fit easier. 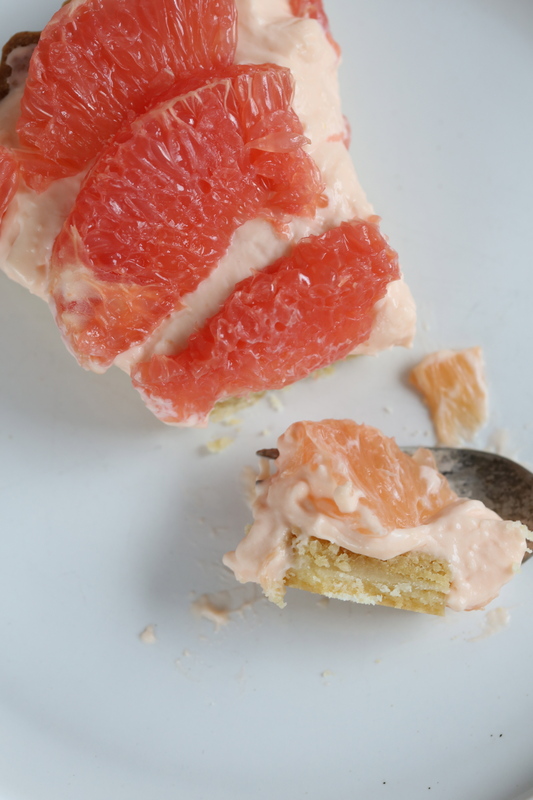 Love your grapefruit segment pattern! 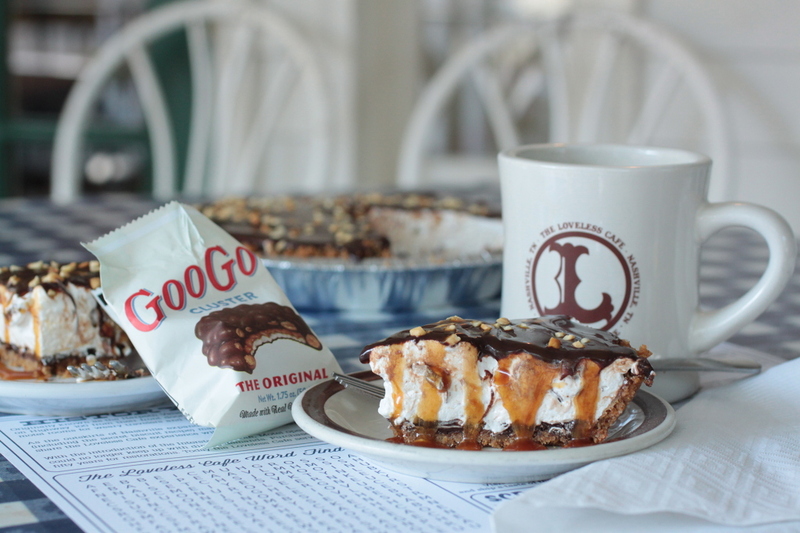 Great photos — your tart looks so yummy! And your idea of marbles and coffee filters is one I’ll use in the future. Lovely tart and great photos as always. I’ve heard of using coffee filters but the marbles are definitely new to me…I’ll have to try them. 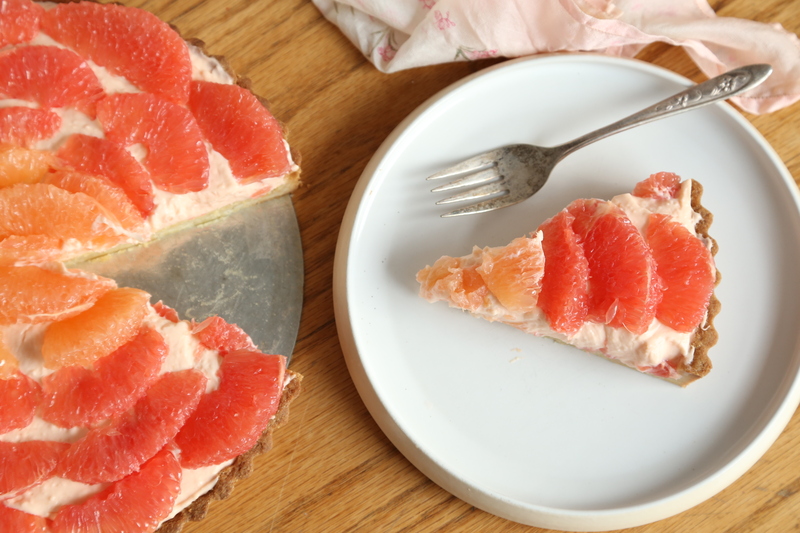 Your tart is just gorgeous with the grapefruit sections arranged just so. Nice job. I loved the photo with the marbles…it’s like my childhood gazing at them, I can remember each one of those colors and sizes that we used in games as children. I still have some, but not near the amount we used to have or that you have shown. I have used the same beans for my pie weights for probably 20 years, they seem to hold up and keep doing their job. Thanks for the marbles memories! Beautiful photos of your lovely tart. I love the idea of marbles. I’ll have to try them next time. Great tip about the coffee filters (I’ll see if the restaurant I’m working for will let me have a couple of the big ones)…brittle parchment often falls apart when I take out my beans and I’ve never liked using foil to line. I think your grapefruit rose looks so pretty! Would love to have this be gelatin-free, too. 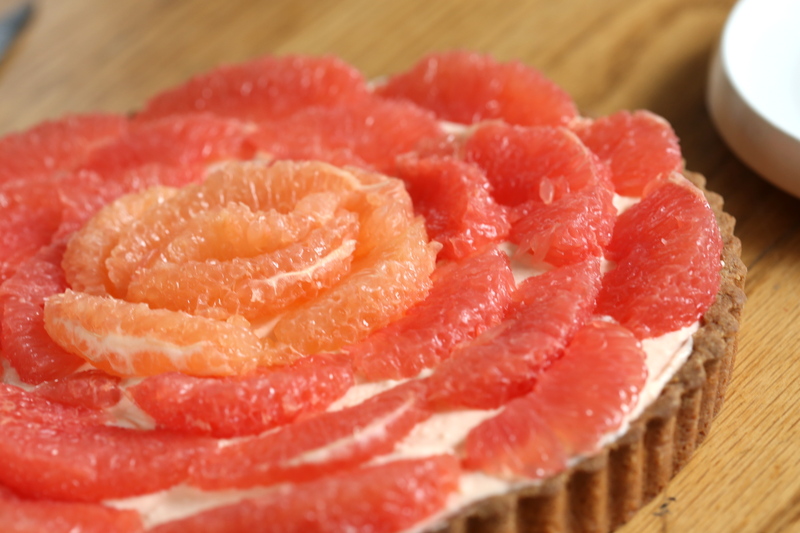 Beautiful tart, I love the way your arranged the grapefruit sections, lovely. I’m sorry you didn’t like this one better. It was an awful lot of work for something you don’t absolutely love…I’m with you on grapefruits. My favorite way to eat them is plain, out of hand. Your tart turned out so pretty. The raspberries are a great idea for an alternate topping.